The socio-cultural changes in the context of the transformation processes in the Balkan countries and their consequences have not been reflected very much. For this reason there is a high need for meetings, seminars and other educational offers, which contribute actively and sustainably to the sphere of democratic education. After a long vacuum, people in these countries will become aware again of the pedagogical importance and chances of non-formal youth and adult education. In this context FAR understands itself as a place for non-formal, integral, political and social learning and offers space and time for pedagogical arrangements outside school and public institutions. Through contemporary education programmes FAR is able to provide continuing education for wide circles of society. 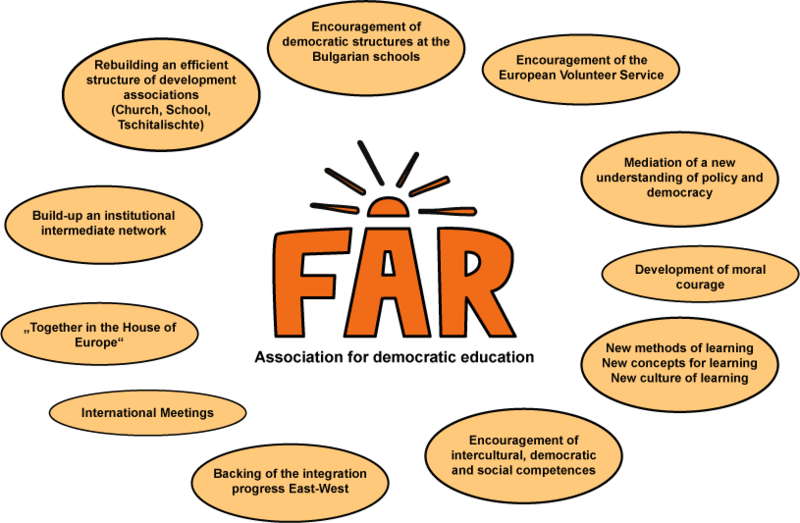 FAR aims at establishing its educational offers for youths and adults according to its experiences and applying new methods. Therefore the activities should be geared towards the current local situation and communicate socio-political contents in seminars in an applied way.